The cooler temperatures of fall are a welcome change at the end of a hot summer. 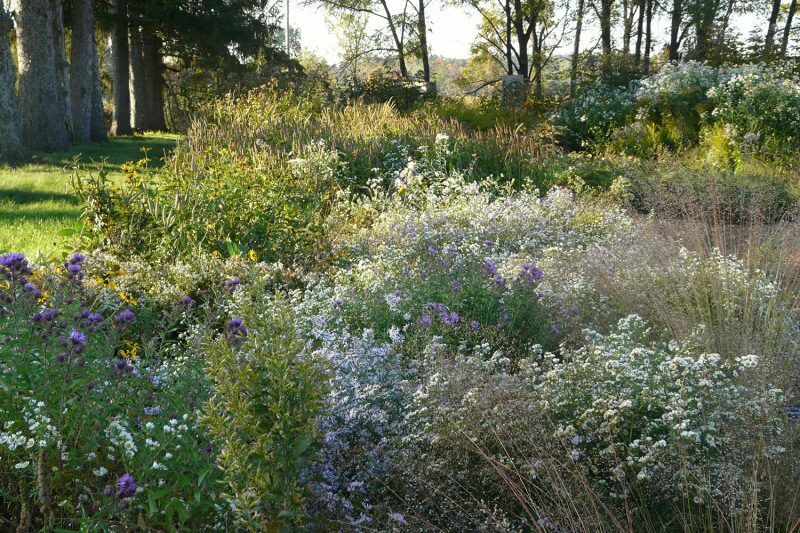 Along with cool misty mornings, golden grasses and sliver puffy clouds, fall also brings a perfect opportunity to plant more perennials. Whether supplementing an existing planting or installing an entire garden, the soil and air temperatures during autumn present the perfect conditions for root establishment. Plus, planting in the fall gives you a big jump on spring gardening and maybe even opens up more time for other spring projects. If you’re accustomed to only planting in spring, here are few important tips to keep in mind as you plan an autumn plant installation. 1. Take Stock at the End of Summer. At the end of summer it’s easy to remember the garden’s progress. Your observations of the past season are still visible: where to add a tall spiky plants, which areas needed more ground cover, spots that could use more early seasons blooms, and so on. Contemplating the garden at the end of a years’ growth can help you better visualize the changes you are considering. Plan ahead. Determine which plants you need, and order early. 2. When to Plant. Don’t wait until the cold winds begin to howl to install transplants (unless you live in zone 8 – 11, in which case you can pretty much plant anytime of year). The plant roots need time to get established, so try to install your plants at least six weeks before the ground freezes solid. We start shipping plants during the second week of September. The further North you live, the earlier you should plant. Ordering plants in early August will ensure a good delivery window and you’ll have the best plant selection, too. 3. Plant Spring Ephemerals in Early Fall. Spring-blooming perennials, especially in the bare root form, are best planted early in the fall. Planting in the fall while the soil is still warm will give the roots enough time establish properly. This allows the plants to emerge from well established roots, with a stronger start, the following spring. 4. Soil Temperature. The soil temperature is warmer in the fall than it is in spring, and this encourages root growth. And since the plants are usually not producing flowers, they’ll have more energy for root establishment. 5. What About Frost? Frost will stop the growth of the plant above ground, but it will not kill the plant. The roots will continue to grow until the soil freezes solid. 6. Plant Condition and Dormancy. At the end of the growing season many of our native perennials have finished their growth cycles, and they may not be looking their best. Spring ephemerals are completely dormant in the fall, with no growth showing above the roots. Because of this complete die-back, ephemerals are often shipped as bareroot stock. Plants that bloomed earlier in the summer will also be well past their prime and may look very tired as they head towards winter dormancy. Simply plant them with the same care that you would bestow upon a thriving green plant in the spring. 7. Watering. Before planting, water the plants thoroughly and let the roots completely soak up the water. With the lower temperatures, the lower sun angle, and the shorter days, plants generally need less watering in the fall. Water them once per week until the soil freezes. 8. Mulching. Fall transplants do not need to be mulched immediately. The new growth will benefit from the sun warming the soil, even in October. The transplants should be mulched at when the cold weather sets in – apply mulch when the night temperatures are consistently 32 degree or lower and the soil is beginning to freeze. Mulch can be leaf litter or other spent plant material, straw, etc. Remove the winter mulch in the spring, after freeze-thaw cycles have passed. 9. Preventing Frost Heave. Once the plants are in the ground, a freezing and thawing of the soil can result in “frost heave” – wherein the thawing soil causes plants that aren’t fully anchored to raise up out of the soil – which puts the plant in danger of being killed by cold. After the soil has frozen hard, spread a few inches of straw mulch around the transplants. A good layer of straw will keep the ground from thawing around the plants. Once they are mulched you’re ready for winter. When spring arrives, pull the mulch away from the plants, to allow the soil warm up faster around the plants.